Intermittent Catheter with Guide Stripe - Single Unit - 14 Fr. 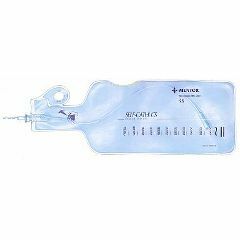 The Coloplast Self-Cath Closed System Kit is a latex-fee unisex system that provides a method for safe, simple catherterization designed to reduce the risk of urinary tract infections. It includes 100% latex-free Coloplast Self-Cath catheter. The new EasyOff tear tab makes it easy to use, even for patients with limited dexterity. Should have ordered povidone swabs with it.